Pakistan have embarked on yet another tour to Sri Lanka with the first test starting tomorrow at Galle. The two countries are familiar foes having played each other regularly in the recent past, yet this two test series has a lot at stake for both the teams. The last test series between Pakistan and Sri Lanka was played in the UAE and ended in a draw after Pakistan completed a record chase on the final evening of the series. In the past 3 years, the teams have played 3 test series with Pakistan winning one, Sri Lanka winning one, and a drawn series. If that isn't close enough, the last 14 test series between the two teams comprises of 4 drawn series, 5 won by Pakistan, and 5 won by Sri Lanka. Furthermore, these 14 test series played between them over the past 22 years has not witnessed either team win two consecutive series. That shows that there is not much to choose there. Both teams, however, are going to be highly motivated for the upcoming tests given the significance attached to the series. For Pakistan, this is going to be their first test series since becoming the number 3 test side in the world, and they would want to keep their ranking intact, and look to improve it going forward. Furthermore, Pakistan have not won a test in Sri Lanka for 8 years. The last time they won a test in the island was in 2006, when Mohammad Asif's magical bowing blew away the Lankans. 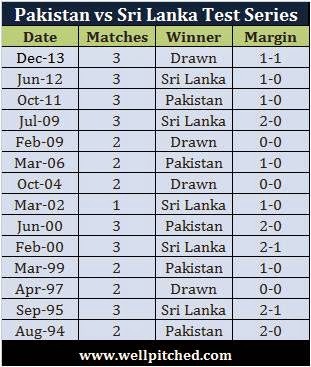 Since then Pakistan has played 6 tests in Sri Lanka, losing 3 and drawing 3. Pakistan are looking to turn their fortunes around this time and want to end their drought in Sri Lanka. Moreover, Sri Lanka are coming from a rare series loss at home at the hands of South Africa and they will want to ensure that they don't lose another series at home. With so much at stake, both teams will be looking to gain a lead, which can be a series winning one, in what is only a two test series.